LAWRENCE – In China, where a skyrocketing divorce rate is the focus of national attention and everyday conversation, popular culture offers cautionary tales of middle-aged women undergoing self-improvement campaigns to save their marriage. But research by Hui Faye Xiao, an assistant professor of East Asian languages and cultures at the University of Kansas, shows that women trying desperately to keep their marriage intact isn’t the reality in China, where more than half of all divorces are initiated by females. 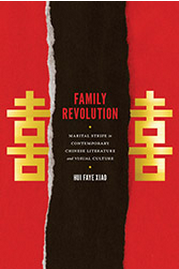 This spring, Xiao published the book “Family Revolution: Marital Strife in Contemporary Chinese Literature and Visual Culture,” the first book-length study on Chinese divorce narratives. Xiao watched the show, which centers on a middle-aged woman attempting to save her marriage, with shock, indignation and intellectual curiosity. The series is just one example she provides in her book on recent portrayals of divorce in China. Depending on gender, age and class, divorce in China produces different narratives, Xiao said. For well-educated and financially secure women, divorce can be a way out of an unhappy marriage. For their husbands, it can be seen as a threat to their masculinity. And, for some less well-paid or even laid-off women, divorce can leave them vulnerable. In “Chinese Style Divorce,” the female lead was a hard-working and well-respected teacher. She left her job to care for her son, leaving her financially insecure. In the end, the character strives to save her marriage, including self-criticism in front of her husband and his colleagues. “It suggests that women in unhappy marriages should make every possible effort to improve their gender qualities instead of seeking a divorce,” Xiao said. For generations China had seen a low divorce rate, in part due to a combination of social policies and a longstanding Confucian tradition emphasizing domestic order and family relationships. Marriage and divorce laws loosened. In the 1980s, couples could separate based on the mutual alienation of feelings. In 2003, employees no longer needed permission from the head of their work unit to get married or divorced. The following year, 2004, was dubbed “The Year of Divorce” in China. It was also the same year that “Chinese-Style Divorce” aired. Since the state no longer provides free housing to married couples, a greater degree of privacy, freedom and autonomy exists in the home. However as more emphasis is placed on domestic life, the burden of maintaining it falls largely on women. That shift has caused a resurgence in traditional gender roles, Xiao said. Contemporary Chinese society emphasizes self-fulfillment and individual identities, but much of the time domestic order comes at the expense of a wife’s emotional, educational and professional fulfillment. Xiao points to women who were laid-off so they could return to the domestic sphere and the emergence of a quasi-concubine system where wealthy businessmen have one “legal wife” and multiple “second wives” living in different housing units. “The privatization of domestic life is very much dependent on gendered division of labor, which is why you see rampant gender-related issues,” Xiao said. See more information about Xiao’s book at the University of Washington Press.